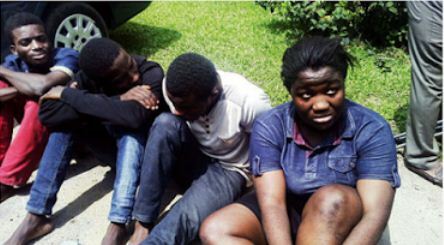 An undergraduate of Imo State University ,IMSU, has confessed that she plotted her kidnap in order to extort money from her father because he is stingy despite being rich. The suspect, identified as Chinwendu Udensi, was paraded alongside her accomplices by the Rivers State Police Command. The police commissioner said: “Miss Udensi plotted her kidnap and demanded N6 million ransom from her parents. She was, however, exposed when she sent one of her accomplices to pick the ransom on Obiri Ikerre flyover at Obio/Akpor. “On November 6 about 4pm, Chinwendu Udensi, a female student of Imo State University, was kidnapped by gunmen in Imo State. “The kidnappers called and demanded N6million ransom. Men of the Inspector-General of Police (IGP) Monitoring Unit led by Ben Igweh set bait for them and as they went to pick the money on Obiri Ikwerre flyover in company of the victim, they were arrested. The suspect, a native of Imo state confessed before newsmen that she committed the crime because her rich parents did not take care of. She said: “I did it to get money from her wealthy but stingy father. “Nothing much happened. I wanted to collect money from my family, so I faked my kidnap. I did it to continue my schooling. “I’m not happy about my present condition because I never thought it will be like this. “I sincerely apologise to my family for the trauma I might have caused them in a bid to extort money from them for my project and other requirements. Regretting her actions, the suspect advised her friends and youths not to indulge in such crime.